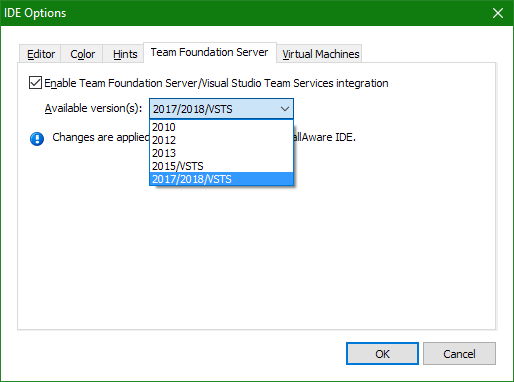 The InstallAware IDE directly integrates with Microsoft Team Foundation Server versions 2010, 2012, 2013, 2015, 2017, and 2018. InstallAware also integrates with Microsoft Visual Studio Team Services. 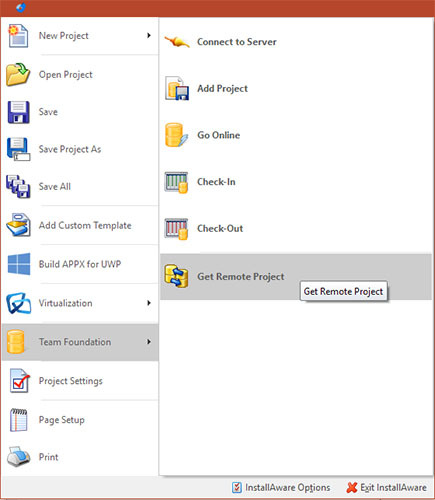 A single click on the InstallAware button in the InstallAware IDE gives you rich access to all Team Foundation Server actions. Thanks to the rich object model consumed by InstallAware, you have a much broader scope and much tighter level of integration with TFS when using InstallAware. Another Microsoft Stack component that InstallAware is fully integrated with is Visual Studio, featuring single-click APPX, App-V, Windows Installer MSI, and Native Code Setup Engine (EXE) package creation.